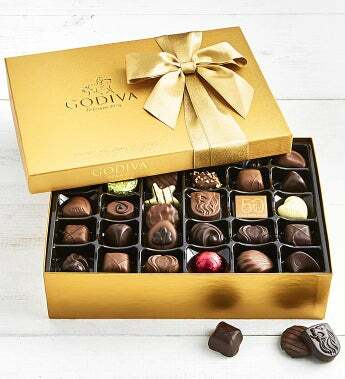 Make the ultimate good impression when you send this 70 piece assortment of the finest that Godiva has to offer! This opulent and iconic gold ballotin gift box is filled with Godiva's top products including Cinnamon Blush, Coffee Feather, and Milk Ganache Bliss chocolates. Kosher OU-D. Gift Measures 11.25" x 8" x 3.25"
Gift Measures 11.25" x 8"" x 3.25"